Strobelight enables backlight strobing on LightBoost-capable monitors. For more information about LightBoost and backlight strobing, visit BlurBusters.com. AMD Radeon RX-series cards - ToastyX Wrote: RX-series cards have communication issues with DVI. Workaround: Use DisplayPort if possible. No solution is available for DVI at this time. Run strobelight-setup.exe to install the refresh rates required to enable backlight strobing. 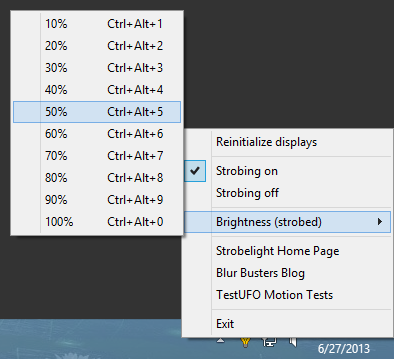 Strobelight will initialize any monitors if necessary and stay running in the background to handle keyboard shortcuts. The initialization process can take a few minutes, but it only needs to be done once unless the monitors lose power. Run strobelight-setup.exe and reset the display. Remove strobelight.exe from the startup folder. Note: strobe toggling does not work in full screen games. strobelight-init.exe = Initialize any monitors if necessary and quit. It will not stay running in the background. Keyboard shortcuts will not be available. strobelight-hide.exe = Hide the tray icon. It will stay running in the background to handle keyboard shortcuts. You can use the task manager to end the process. Thanks a lot for such an app, guys! Excellent work! I don't have a LB monitor but had heard that this significantly simplified activation tool was in the works. I wanted to thank ToastyX for doing such a wonderful job in this LightBoost utility! Also, TestUFO, the Blur Busters Motion Tests is going to launch this weekend -- it is an excellent way of verifying whether LightBoost works or not. For the record, Blur Busters only did testing of ToastyX Strobelight on nVidia products (I own multiple LightBoost monitors, both ASUS and BENQ). I believe in supporting nVidia because they made LightBoost. If you have not purchased a GPU yet, please consider leaning towards green instead of red. Although LightBoost can now be enabled independently of 3D Vision drivers (a side effect of any third party "easy LightBoost utility") -- Blur Busters does not wish to upset nVidia, while gently pointing out that nVidia needs to un-bundle LightBoost 2D from 3D Vision, and make it make it easier to enable LightBoost (like turning VSYNC ON/OFF). Again, please lean towards the Green Side (aka nVidia products) if you haven't purchased or upgraded your GPU yet. Also, to test whether Strobelight is working use www.testufo.com -- the Blur Busters Motion Tests. The best web-based motion test for LightBoost is: TestUFO: Moving Photo Test .... Turn on/off LightBoost while viewing this webpage in Google Chrome browser (the only release web browser at this time of writing to support VSYNC 120fps @ 120Hz). Any chance I can get this to work with my AOC g2460Pqu. 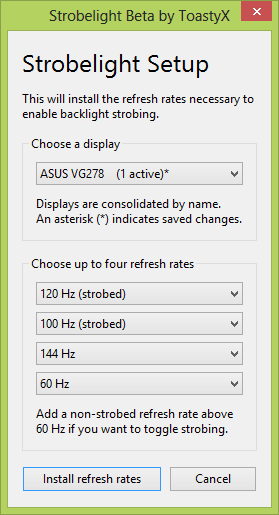 (06-29-2013 10:57 AM)funky Wrote: Any chance I can get this to work with my AOC g2460Pqu. Someone will have to test it and report if it works. I ran strobelight-setup before, added strobed frequencies and rebooted. What seems weird to me is that the setup forgets which frequencies I selected every time I restart it. Copy strobelight.exe to the desktop and rename it to strobelight-debug.exe, then run it and give me the debug.txt file. The setup program does not read existing settings. (06-29-2013 04:38 PM)ToastyX Wrote: Copy strobelight.exe to the desktop and rename it to strobelight-debug.exe, then run it and give me the debug.txt file. [2013-06-29 19:15:10.980] INIT: No compatible displays found. Are the brightness options supposed to have any effect directly to the user's desktop or only in game screen?